Posted bycarlarjenkins	 November 23, 2018 November 23, 2018 Leave a comment on Black Friday Is Here! Save on All of Your Faves! 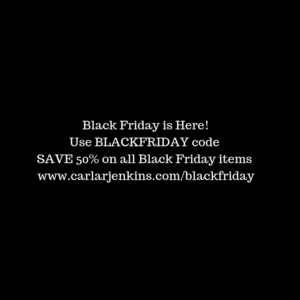 Grab your wish list, copy/paste this 50% coupon code: BLACKFRIDAY and run on over to www.carlarjenkins.com/blackfriday to unlock your exclusive savings on whatever you buy this weekend from us. P.S. Don’t forget to use the BLACKFRIDAY coupon code I gave you.